With Jon and I both testing MFactory's new coilover system for the Focus ST, we would now have camber adjustment for the front struts. We weren't happy with idea of having to drop the strut each time we needed to access the camber plates. We decided to look into a solution. Looking around I quickly found on other cars it's fairly common practice to simply cut the top of the strut tower out to get access to them from up top. 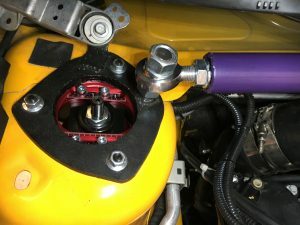 Below is our how to, so that you too can have access to your camber adjustment without having to drop the strut. The method we used was to use a hole saw to drill through the frame. There are other routes you can use such as a hydraulic punch kit, plasma cutter. 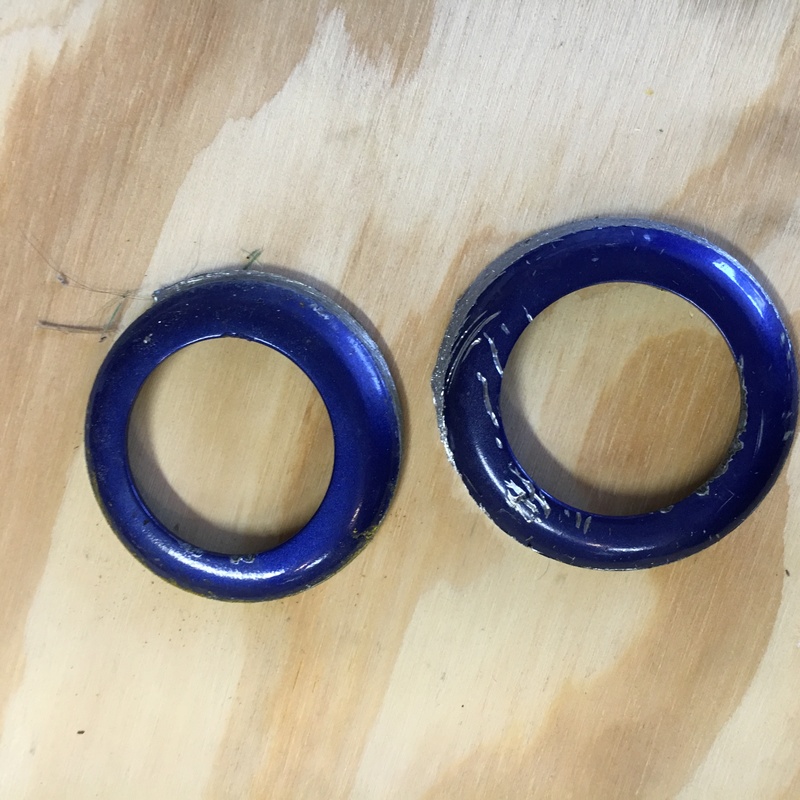 We did not use these methods, because we did not have access to either of them, and the cost of purchase or rental for us would have been more than the cost of parts in the drill method, at least for our area. 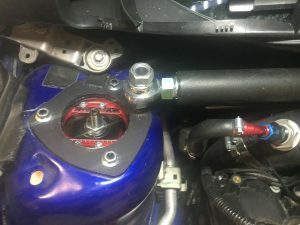 Note: This can be done without the TB performance brace, but for this How-to it plays a crucial part, and since both of us who were doing this mod had this part we didn't plan an alternative. This install is also assuming the TB Performance brace is already installed on the car. You'll need to loosen and remove the bar, but not the plate. You need to do this as the helm joint that secures the bar to the plate will hit the drill bit. If the bar isn't on the car already at this step remove the stock strut bar. Undo the 3 bolts to your top hat. Hold the strut while doing so, so you can let it down gently. It wont fall completely as it is still attached to the lower knuckle. Using the hardware that held the top hat(or just generic nuts and bolts) to the strut tower secure the strut bars place back down to the car. The purpose of this step is to use the strut bar's plate as a jig/guide for our hole saw. Without having a guide the bit is just going to wander. The TB Performance bar is perfect for this, as the plate is thick, and the opening is 3 inches, so the bit sits inside nicely. Now it's time to start drilling, setup the bit by attaching it to the Shank Quick-Change and to the drill. For Jon and I we both had hood struts on our car, which opens the hood up higher than if we just had a prop rod. 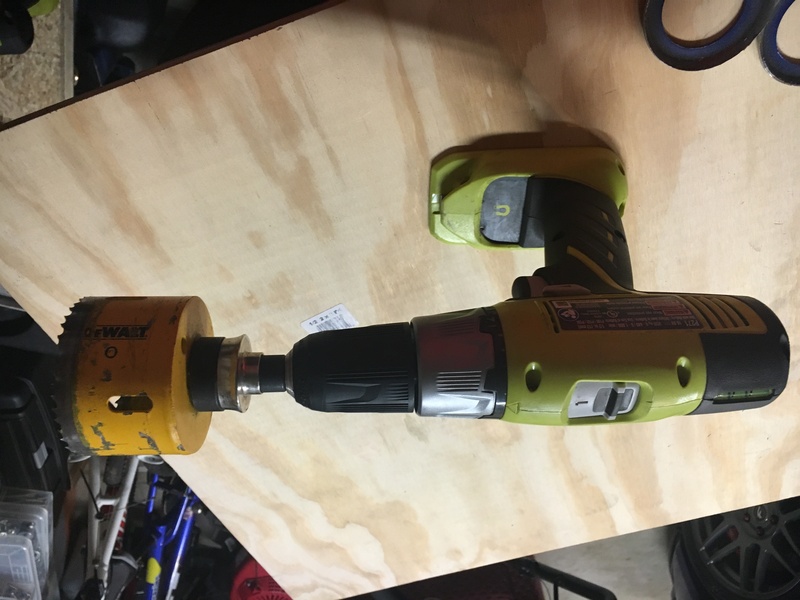 This came in handy as the length of the drill with bit was 13.25 inches, and it just cleared under the hood and allowed us to drill straight down. You'll now want to prep the area by blocking any metal shavings from going into the engine bay or down into your strut and brakes. We used old bed sheets, and laid them around everything. Start drilling. 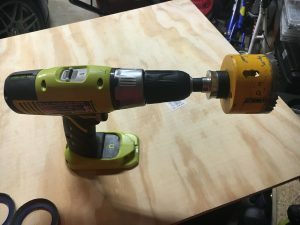 When you drill, you want a lower power setting with a lot of torque. You then want to keep the bit spinning at a consistent rate, but not spinning really fast and uncontrollably. If you spin it to fast, you'll just wear out the bit. This is were the multiple batteries come into play. When Jon and I were doing ours, we drained 2 batteries and kept overheating the drill and batteries. It was 90+ degrees out and quite humid. Spraying water on the drill helped, but we still had to let it cool down for 5-10 minutes sometimes. That's where the freezer came in handy. The first piece will pop off is the bubble like disk around the strut. If you look at the hole it won't be a 3 inch hole at this point, but significantly wider than it was before. This still wasn't wide enough for proper full adjustment. So we continued drilling. It'll then pull off a ~1/16" ring, that'll make the hole 3inches and the edges flush with the TB Performance Strut Brace plate. The hard parts over, now it's time to touch up. Using the dremel, sand the cut edges and lips, to remove any burs, or lips to create a smooth edge. Use your touch up paint to paint the sides of the hole that you just opened. You don't want any bare metal exposed as it will rust. You'll now want to remove the sheets making sure to collect as much of the shavings as possible. Then use a vacuum to clean up the rest. This side is now done and you can proceed to the next side. Once both sides are done, you want to put everything back together. Starting with re-attaching the strut to the frame, followed by the bar for the strut bar, tightening it down. Finally by re-connecting your sway bar, putting the wheels back on and lowering the car. 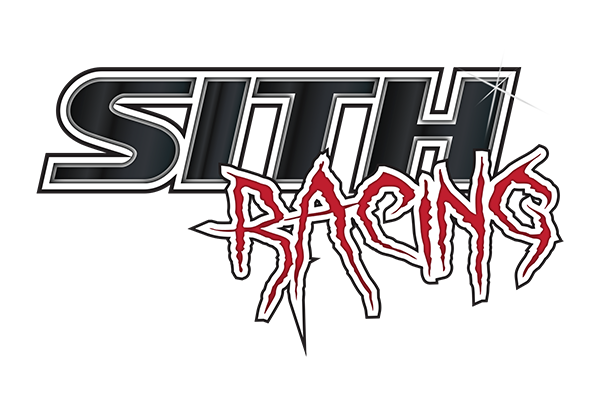 Disclaimer: Neither Sith Racing nor the writer of this post is responsible for any damage, or injury during or after this install. You perform this install at your own risk. 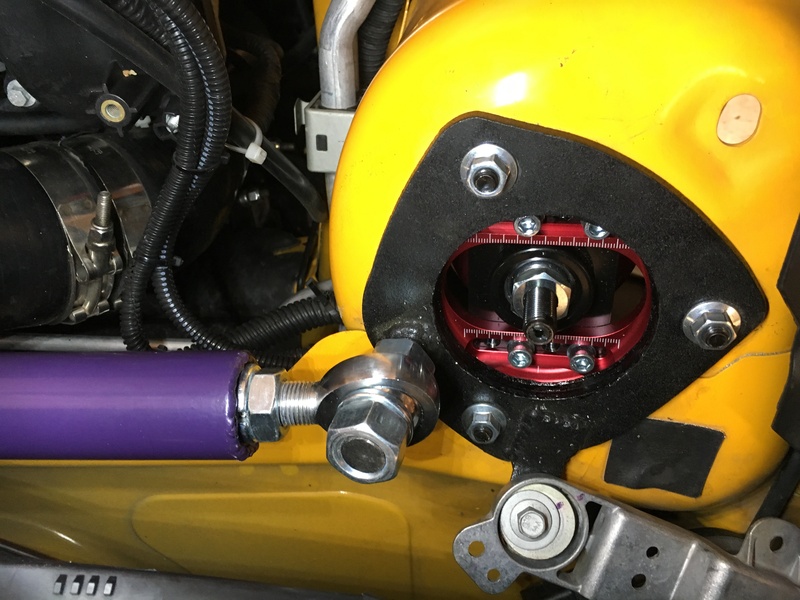 This entry was posted in Build Guides, Primary Information, Technical Information, White Papers and tagged Camber Adjustment, DIY, Focus, ST, Strut Tower, TB Performance. Bookmark the permalink.